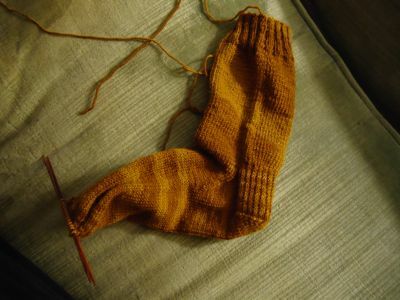 Remember this sock? 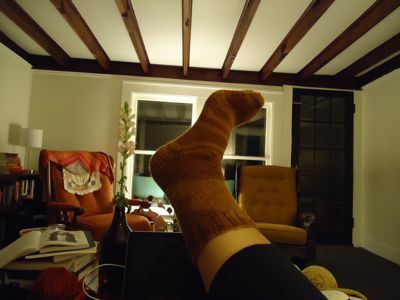 The decidedly unfancy sock (so named because it was once the beginning of a gentleman’s fancy sock, and then I needed something mindless to knit on during a lecture, so it became stockinette, or unfancy) that I think I said I was going to finish before my exams? Well, last night, I was rooting around in my knitting bags looking for something simple to work on, and I found this, a row or two away from kitchenering. Yes, that’s right: kitchenering. And it felt great. About as great as actually writing 500 or so words yesterday. 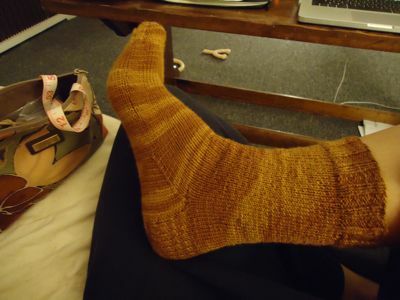 So I cast on the second sock. In looking for something to knit on yesterday, I realized that I have a lot of sock yarn. And that I like big (read: larger than one skein) shawls. Which means lots of stripes in my future, but also that I should try to re-find my sock mojo. So I’m on that.